Central station air handlers require constant attention to ensure the units perform efficiently and have a longevity of up to 2 to 3 decades. By their very nature and because of space conditions, these units almost never have enough space and access to make this job an easy one. Most units fabricated before 1985 are a single-wall type with insulation exposed to the air flow and have access panels rather than hinged and latched doors. There is usually no room between heating and cooling coils, and many have exposed motors and drive components. Over the last 30 years, most units upgraded to a double-wall construction (insulation protected from the air and elements inside the unit), with interior mounted motors, integral spring or R-I-S isolation bases, hinges, and latched access doors. In short, our industry has come a long way in the central station design over the last three decades. Let’s work our way from unit inlet to outlet and review some relative maintenance tips. Air dampers can leak and provide added resistance, which creates air reduction in your unit. Blades may be bent or crooked which adds to the resistance and allows unwanted outside or return air to leak into the system. Have a specialist test your damper’s movement while also testing the crank arms, linkage, and power signals to be sure it’s operating correctly. Many times, it will require a new actuator to modulate the damper. Protection of the downstream components in an air handler always starts with the proper selection of filtration. The changeout of the air filter media should be required by the service of your system. Many systems have furnace type filters installed, and many maintenance personnel do not realize that the system will operate much more efficiently with a higher MERV factor filtration. Almost all central station units have a 2” filter track that can be upgraded to MERV 13 to 14 with higher efficiency filter cartridges. The cost of these higher efficiency filters will increase the air quality within the space and will cost far less than the potential problems related to components downstream. Install static filter sensors outside of your unit and make note of the static pressure for the filters installed when it has “Clean”, “Average”, or “Dirty” resistance. When filters are above average or dirty, they need to be changed. The operating horsepower (HP) to overcome higher filter static pressure is extensive. Without changing the drive speed, the extra filter resistance can cause a 10 to 15% reduction in the volume of air. There is a double problem with reduction of air flow. One problem is less air flow but there is also a problem with less BTUH supplied to the space, as the volume of air flow has a lot to do with overall BTUH capacity. The good news about any finned tube coil is that its design is predicated on air contact with the surface, which increases the heat transfer and overall BTUH capacity of the coil. The bad news is that contact can be detrimental when the air side surface contains dirt, foreign materials, or biological organisms. USA Coil & Air has been in the coil business for 4+ decades and has confirmed that coils can be cleaned from each side about 2 rows into the finned tube surface. This means that 5-row, 6-row, and 8-row coils can’t be cleaned properly if the foreign material lodges well into the center of this very dense finned pack. If you clean with a commercially available cleaning agent, make sure these agents are thoroughly removed from the coil surface. Also, watch the water pressure that is delivered to the surface of the coil. The coil installed in your unit may have very light duty fin thickness that may cause fin crinkle and flapping. This will increase the static pressure of coils, which in turn reduces air flow quantity. If you know that the water quality in your system is suspect, then be sure you open the supply or return connection every few years and shine a light down the exposed tubes. If you see a dramatic caking along the walls of the tube and inside the header, your coil may have reduced efficiency. This caking type of fouling acts as an insulator between the air on the outside and the fluid inside. We have seen up to 40% reduction in BTUH capacity in coils. Coils may need to be replaced if this happens, because most designs do not have the ability to be cleaned internally. Check the drain pan lines and overall condition of drain pans. Until a few years ago, most drain pans were galvanized steel. This is a coating that eventually wears off and exposes bare metal in an area where water is prominent. Fans and motors are operating at high speeds, and the operator of a unit can tell by noise alone whether something needs to be reviewed or replaced. If you have a fan that is out of balance or a motor where the windings are shot, replacement is in order. When a general inspection is required, check the housing of the fan and touch up corrosion areas to increase the life of the fan. Also check the wheel set screws and fan shaft bearings for wear and tear. USA Coil & Air has been a replacement specialist for coils and air handlers for many decades. The details in this article can help you with reduction in efficiency and increase the unit life expectancy. Many units are inherited from a design standpoint that makes this effort very trying. USA Coil & Air can assist with the replacement of the coils and provide a better design. 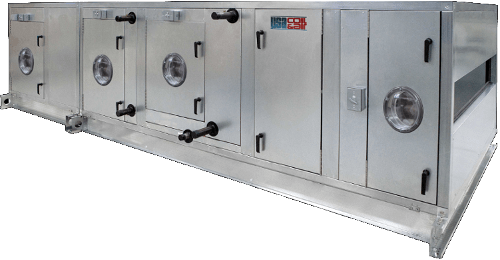 We will help you with a new air handler that has space, access doors, and all the bells and whistles of today’s better designs. Call us for your next coil or air handler replacement. It’s our business, and we do it best!